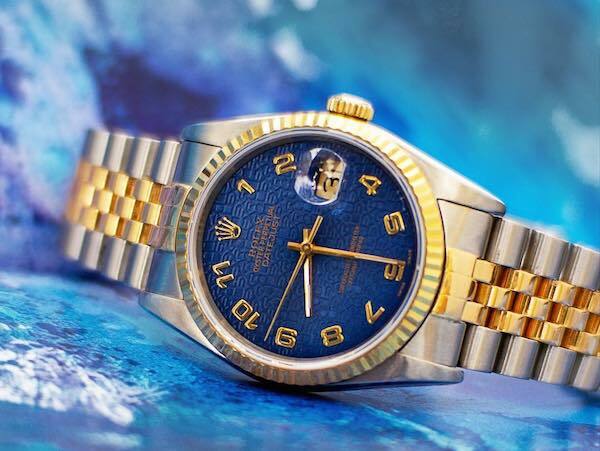 Although green the color most associated with Rolex, we are all about their blue watches these days. Blue has been a huge color trend in the luxury watch landscape for the last few years. Depending on the exact shade of blue and how it is used on a watch, this is a hue that can be treated as an understated neutral or as a way to add a dash of color to your wrist. 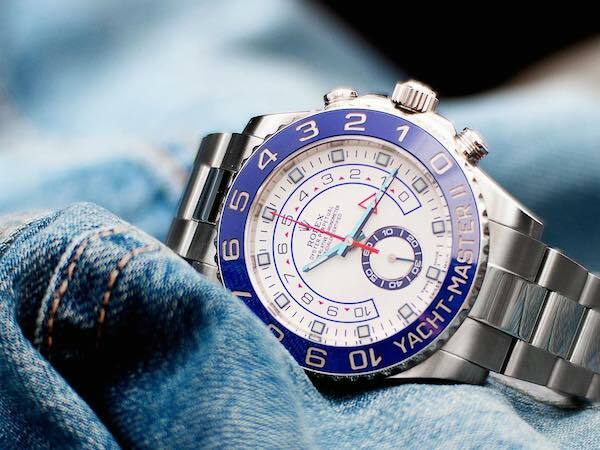 From sporty to dressy to casual, join us as we highlight some awesome blue Rolex watches. Perhaps the world’s most famous luxury watch, the Datejust has been a signature timepiece of Rolex since its debut in 1945. The Datejust manages to be instantly recognizable as a Rolex, yet vastly versatile with a slew of options to choose from. Between the different metals, dials, bezels, and bracelets, there are countless configurations of the Rolex Datejust. A particularly popular dial option is the Jubilee dial, characterized by a surface blanketed with ROLEX ROLEX ROLEX. And when the Jubilee dial is in blue, like this striking two-tone Datejust ref. 16233, the dial simply pops. Contrasting with the bright blue dial are the 18k yellow gold Arabic numerals and center hands. The yellow gold accents continue with the 18k yellow gold fluted bezel on the 36 mm steel case and 18k yellow center links on the steel Jubilee bracelet. For a sporty yet elegant blue Rolex watch, we turn to the iconic Submariner. 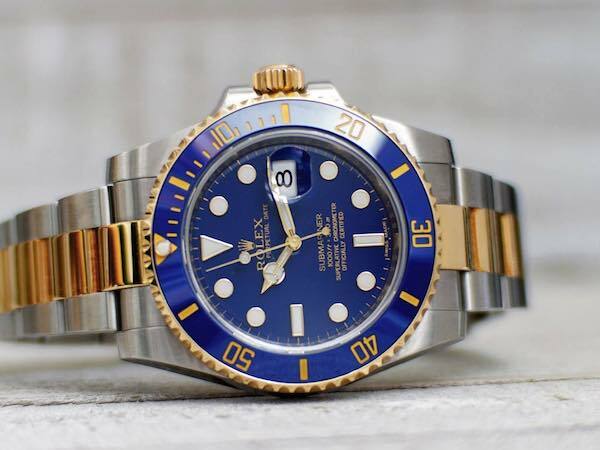 Although the Submariner began as a no-nonsense tool watch for scuba divers, these days the Sub is better known as Rolex’s must-have luxury sports watch. The two-tone Submariner ref. 116613 looks particularly great with a blue dial and blue bezel configuration. As the current two-tone Submariner, the ref. 116613 comes equipped with the ultra-modern Cerachrom ceramic bezel on top of the 40 mm Oyster case. The 60-minute markings on the ceramic bezel insert are filled with 18k yellow gold to match the other yellow gold details–namely the bezel, winding crown, and center Oyster bracelet links. Furthermore, the luminescent hour markers on the blue dial are also fashioned from 18k yellow gold to prevent tarnishing as are the luminescent Mercedes-style center hands. 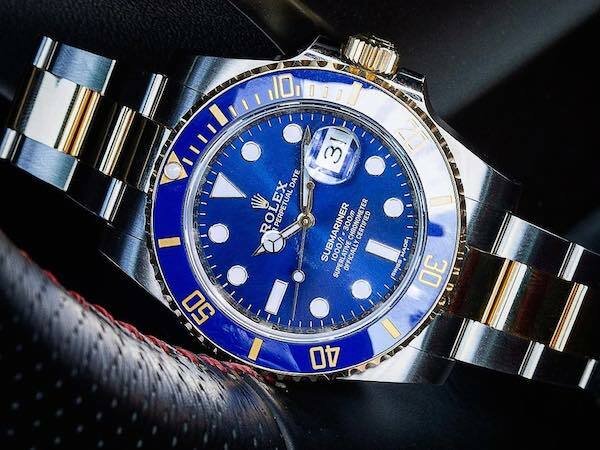 One of the largest watches available in the Rolex catalog, the 44 mm Yacht-Master II definitely makes a statement on the wrist–particularly with its bright blue bezel. Rolex debut the Yacht-Master II collection in 2007 as the evolution of the Yacht-Master watch. While the original Yacht-Master was positioned more as a luxury watch to wear while leisurely cruising aboard a boat, the Yacht-Master II is built for the professional yachtsman, complete with a mechanical regatta timer. The Yacht-Master II ref. 116680 is the stainless steel version and sports the unmistakable Cerachrom ceramic bezel in blue. The crisp white dial is accented with plenty of blue and red accents, from the 10-minute countdown with a red arrow-tipped hand, running seconds register, and red chronograph hand. It’s important to note that the first versions of the Yacht-Master II had straight center hands while the newer versions include the Mercedes-style hands, which are more in line with other Rolex sports watches. 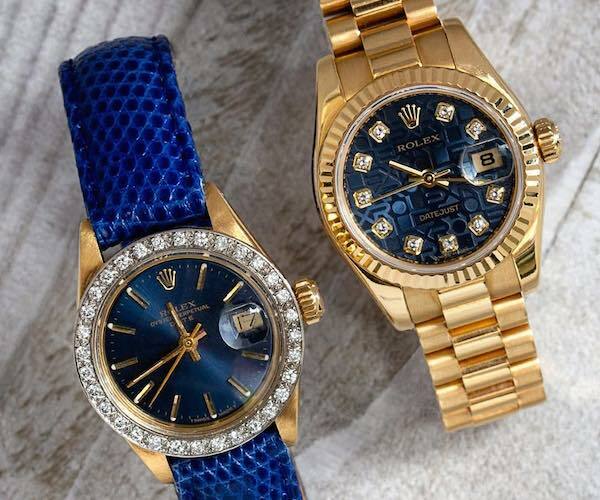 For the ladies, there are plenty of blue Rolex watches to choose from. For instance, a solid yellow gold ladies Rolex “President” watch with the famous semi-circular bracelet looks fantastic with a blue Jubilee dial. Plus, adding to the lavishness of the blue ladies’ Rolex watch are the ten diamond hour markers on the dial. Alternatively, wearing a gold Rolex watch on a blue leather strap is also a gorgeous way to add some color to your wrist. We love the pairing of a yellow gold and diamond-set Lady-Datejust with a rich blue leather alligator strap. Rolex’s signature chronograph watch comes in many forms and one of our favorites is the lavish 18k white gold Daytona ref. 116519. 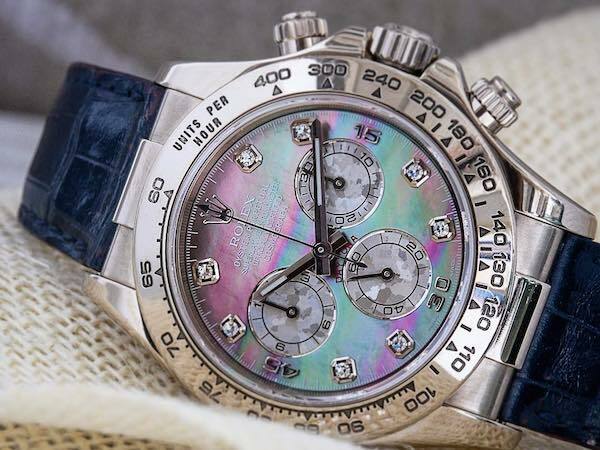 Not only does this Daytona come with a mother-of-pearl dial but it also includes ten diamond hour markers. The watch, of course, includes the familiar 40 mm Daytona case with a duo of screw-down chronograph pushers and the engraved tachymeter scale on the bezel. Rolex does not offer many watches with leather straps so this Daytona stands out for its navy leather strap fitted with a solid 18k white gold deployant clasp. Whether you opt for a blue dial, blue bezel, blue strap, or a combination of them, there is no denying the appeal of a blue Rolex watch.